With just eight days to go until the biggest* single sporting event in the world, SBS Radio is set to broadcast all 64 matches of the 2018 FIFA World Cup Russia™ live and free via the 2018 FIFA World Cup™ and SBS Radio apps. Matches will be broadcast in up to three languages simultaneously; English and in the languages of the teams competing. Direct from Red Square, SBS Radio’s The World Game podcast with Lucy Zelic, will deliver audiences a football fix of highlights every morning, with previews, behind the scenes buzz and key moments from each night’s matches. SBS Radio’s live English match coverage will feature exclusive commentary by former Matilda striker Kate Gill, former Socceroo goalkeeper Clint Bolton and current Melbourne City FC defender Scott Jamieson. 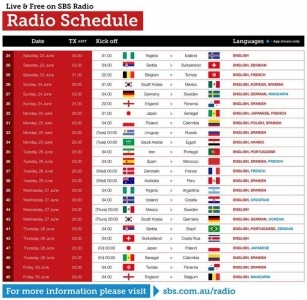 Celebrating Australia’s passion for football, SBS Radio’s broadcasters will join events across Sydney and Melbourne, as communities including Arabic, French, German, Spanish and Portuguese, get together with friends and family to share the experience of the 2018 FIFA World Cup™ live. Listeners can tune into all the passion of live commentary in multiple languages on the 2018 FIFA World Cup™ app, SBS Radio app and nationwide on SBS Radio 1, SBS Radio 2, SBS Radio 3, SBS Arabic 24, on digital television, digital radio (DAB+), analogue radio (AM/FM) and online. Download the free SBS Radio App now for iOS and Android, with the 2018 FIFA World Cup™ app available from 11 June. In addition to the comprehensive radio coverage across language programs, SBS TV will present the match of the day, every day of the 2018 FIFA World Cup™ live, free and in HD for all Australians along with daily highlights and analysis of all 64 matches on television and online. The SBS match of the day will be replayed each morning at 6.30am, free and in HD on SBS, and FIFA classic matches will air on Saturday and Sunday afternoons throughout the month. 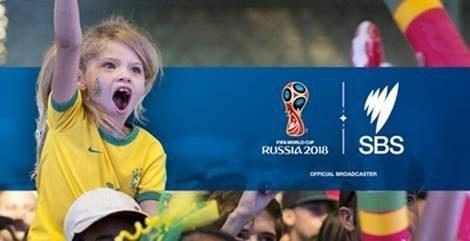 The 2018 FIFA World Cup Russia kicks off on 14 June live, free and in HD on SBS. SBS is presenting the 2018 FIFA World Cup Russia™ in partnership with Optus Sport. Visit The World Game for details on how to watch every match when competition kicks off on 14 June. The world's most linguistically diverse public broadcaster, SBS Radio epitomises the voice of multicultural Australia, engaging with the millions of Australians who speak a language other than English at home with Australian-focussed news and information in their language. 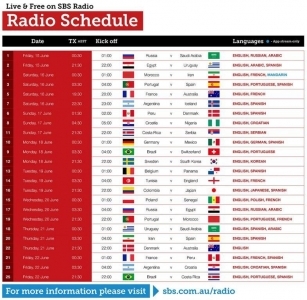 Available across many platforms including AM and FM radio; digitally through a range of platforms and devices and on the free mobile app, SBS Radio provides services in 68 language programs and has four 24/7 digital only radio stations: SBS Arabic24, SBS PopAsia, SBS PopDesi and SBS Chill. A former Socceroo goalkeeper, Clint has won two A-League championships with Sydney FC. More recently he has become a expert voice in the media appearing on different channels including SBS The World Game, SBS Radio and many others. Former Matilda player, Kathryn was named the Asian player of the year in 2010. As a striker she has played 83 times and scored 40 goals for the Matildas. Recently she was named the Deputy Chief Executive at Professional Footballers Australia (PFA). Current player for Melbourne City in the A-League, Scott previously played for Adelaide United, Sydney FC, Western Sydney Wanderers and Perth Glory. His international career took him to clubs in the English Premier league and in the Swedish league. Scott also represented Australia at U17 level and with the Socceroos.